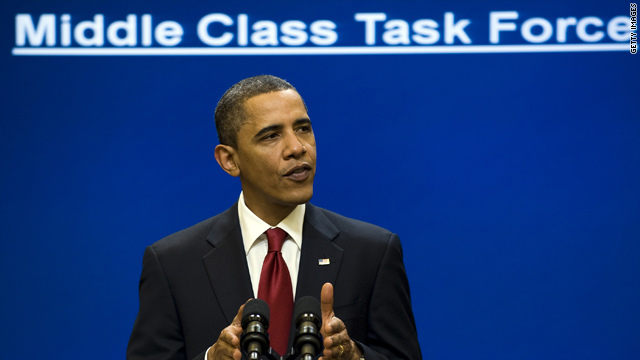 President Obama speaks to the Middle ClassTask Force on January 25. Washington (CNN) -- It's a tale of two speeches. On one hand, top officials say President Obama will use his first State of the Union address to hit the issue of jobs hard by pressing his vow to keep "fighting" for the middle class -- spending new money on everything from child care to student loan assistance and sending signals to liberals that he's not giving up the battle for health care reform. On the other hand, top officials also say a key theme will be fiscal discipline, as Obama tries to get tough on those very same liberals and tack to the political center by pushing a freeze on non-security discretionary spending for the next three years -- including a symbolic move to hold the line on the salaries of senior White House officials. It's a sign of a president still sorting out his next move, as the administration tries to reset for his second year in office after a rockier-than-expected first year, though top aides see no contradiction in the competing messages on spending and austerity. "We are investing in what we believe is important to invest in," explained White House press secretary Robert Gibbs. "We're cutting in programs that we think have outlived their usefulness and that need to be cut. Again, that's what a family does. That's what the government should begin to do." This administration also needs to begin finding ways to again appeal to independent voters, who abandoned Democrats in droves in the three big electoral battles recently in Massachusetts, New Jersey, and Virginia. Obama's balancing act is made all the more difficult by the fact that he's walking into a much more hostile environment than he faced last February for a speech to a joint session of Congress. Even though goodwill was at an all-time high back then, Obama knew full well that it could evaporate quickly. "Here in Washington, we've all seen how quickly good intentions can turn into broken promises and wasteful spending," Obama said last February. Republicans have been circulating that quote in recent days to suggest that Obama himself has been thrown off course, abandoning his promises to bring real change to Washington by going on a spending spree. White House officials fire back that the spending was necessary to stave off a second Great Depression caused by the previous president, and they insist Republicans are the party of "no" and have done little to work with the new commander in chief. The bottom line is that these are the same old predictable corners that each party tends to fall back into after a year or so of a new administration. What this State of the Union address affords Obama is an opportunity to rise above the finger-pointing and use this as a pivot point to show the country he's learned from mistakes in the first year and is ready to make the adjustments necessary to govern. Bill Clinton used a similar speech in 1995 to pick himself and his party up off the canvas following the 1994 election and declare, "The era of big government is over." That not only recalibrated the agenda to give the American people some important victories -- a bipartisan balanced budget, for example -- but it set Clinton up for a sweeping re-election victory in 1996. • On jobs, White House aides are saying the right things about trying to find a bipartisan consensus. "The president has taken steps, and will renew his call to take further steps in the State of the Union, to continue to create an environment where the private sector is hiring again," Gibbs said. But is the president going to adjust the jobs plan he introduced in December, which made little progress when he had 60 Senate votes, so that it pulls in even a couple of Republican votes to deal with the new reality on Capitol Hill? • On fiscal discipline, Gibbs says the president's new budget, to be released on Monday, will take steps to "put our fiscal house in order" after years of excess. But since the spending freeze only covers a fraction of the overall budget -- projected savings of $250 billion over 10 years at a time of $1.4 trillion deficits -- what is Obama going to do about the big-ticket items like defense, Social Security, and Medicare? • After spending so much political capital on health care, how does Obama want to move forward now? So far, aides are being vague about the specifics, with Gibbs saying only the president "will speak about health care" in the speech. Obama has already faced criticism from some in his own party for not being specific enough during the health care fight. Unless that changes soon, and health care gets cleared from the plate one way or the other, it may be difficult to finally move on full time to the rest of the agenda.